A new toolkit, titled Problem-Based Learning: A Case Study of Sustainability Education, was published in October 2013, as part of a three-year project involving Keele University, the University of Manchester and Staffordshire University and funded by the National Teaching Fellowship Scheme (NTFS) of the Higher Education Academy (HEA). The project, Hybrid problem-based learning: a scalable approach to sustainability education?, aimed to explore effective ways of adapting traditional problem-based learning (PBL) approaches for the delivery of transformative sustainability education to large student numbers. In this project the three partner universities developed different sustainability-focused modules for different academic levels and students were involved in the development of the pedagogical approaches. 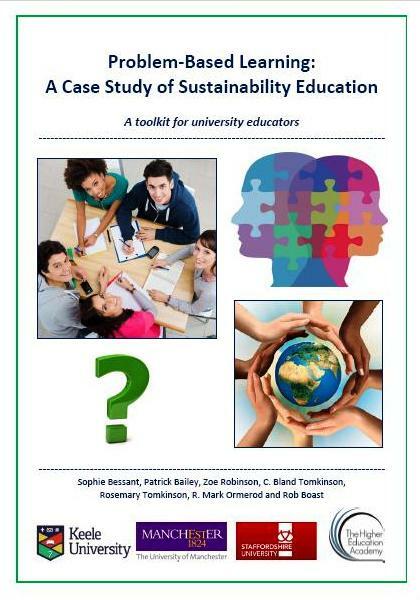 One of the key outcomes of this project is the toolkit Problem-Based Learning: A Case Study of Sustainability Education – A toolkit for university educators, authored by Sophie Bessant (Keele), Professor Patrick Bailey (Keele), Dr Zoe Robinson (Keele), Bland Tomkinson (Manchester), Rosemary Tomkinson (Manchester), Professor Mark Ormerod (Keele) and Dr Rob Boast (Staffordshire). Why use Problem-Based Learning (PBL) for Sustainability Education? It also provides a list of relevant information sources and useful pedagogical examples. The Higher Education Academy (HEA) and Quality Assurance Agency (QAA) will hold a consultation workshop in Birmingham on 5 November 2013 for the development of a new QAA & HEA Education for Sustainable Development (ESD) Guidance Document. Scheduled to be published in early 2014, this QAA/HEA ESD Guidance Document will assist staff in higher education with the implementation of ESD in courses and across the curriculum. Focusing on the development of this document, this workshop aims to gain direct feedback, ideas and suggestions from academics and students from across higher education. The event is not solely for ESD experts and non-ESD practitioners’ contribution to the consultation is strongly encouraged. The day’s core session, Guidance document consultation working groups, will be led by members of the guidance document working group. Feedback from groups and closing remarks will be given by Dr Laura Bellingham (Assistant Director Research Development and Partnerships, QAA) and Simon Kemp. 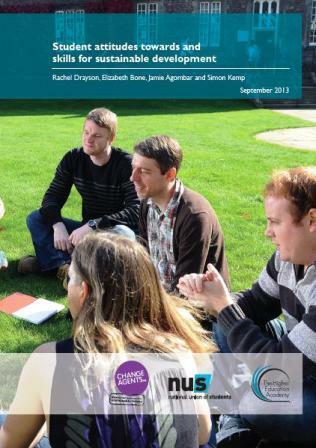 An international conference on Student Action for Sustainability will take place at Keele University on 29 and 30 October 2013. Bringing together staff and students from further and higher education, the conference will explore both the issues faced by staff who support student sustainability projects and the experiences of students who lead projects in their institutions. How do educators enable students to gain the skills needed to bring about transformative social change towards sustainability in their own colleges, universities and wider communities? Beyond preparing students for employment, how can colleges and universities produce graduates who are genuinely ‘change agents’ and ready to ‘be the change they want to see in the world’? What challenges do students face when undertaking sustainability projects within their institutions and local communities, and how can they best overcome these challenges, and optimise the opportunities? What kind of culture needs to be created in colleges and universities so that collective ‘action for sustainability’ becomes the norm rather than the exception? Over 80% of students believe sustainable development should be actively promoted and incorporated by UK universities, according to a new report Student attitudes towards and skills for sustainable development, by the Higher Education Academy (HEA) and the National Union of Students (NUS) published by the HEA in late September 2013. Authored by Rachel Drayson, Elizabeth Bone, Jamie Agombar and Simon Kemp, this report is based on research into student attitudes towards, and skills for, sustainable development (SD) conducted in 2012, continuing research from 2010 and 2011. This national online survey achieved representative samples of 4,099 first-year students and 2,657 third-year students. As in previous waves of the research, all students were in higher education and taking their first degree after less than a year away from formal education.